An Ocean of Minutes had me in its grip. I was so invested in the outcome, I couldn’t put it down. I had high hopes for it, too, when I read that it involved time travel and a flu epidemic. But how was Lim going to make her book stand out from other dystopian novels? Premise: Polly and Frank are madly in love. They’re planning their future together when Frank catches the dreaded flu virus that’s going around. To save his life, Polly travels to the future to work for TimeRaiser, making arrangements with Frank about where and when to meet 12 years later, in 1993. But Polly gets sent to 1998 instead, and the place they were to meet is no longer accessible. The search for Frank and Aunt Donna feels frustrating and impossible. Polly’s despair is palpable – what if she can never find them and she is stuck in 1998 alone forever? She turned off the light and lay down. She pressed the back of her neck against the bed and clasped her hands and jammed her thumbs against her ribs to steady her heart. Of course she would see him tomorrow. Of course he would be waiting on the first floor of the Flagship, sitting in those bulbous burgundy armchairs, where he had a view of the door. Of course she would get there hours before he even formed the thought that she might not make it. And by tomorrow evening, this acid fear that she would never again see his face would have lasted less than a day. 1998 is no picnic. The people travelling to the future are helping to rebuild after the disastrous epidemic. Their food is rationed, their work days and weeks are long, and their living conditions deplorable. Polly is one of the lucky ones with special skills and has traveled there as an O-1, meaning she gets better treatment and accommodations than those who are classified as H-1. Being an 0-1 is bad enough, but when Polly is demoted to H-1, she finds out what the conditions are like for most TimeRaiser bond workers. At first, Polly holds herself at a distance from it all, focused solely on finding her loved ones, but she soon realizes that the only way to get by without becoming mired in despair and hopelessness is to make connections. In her heart, the past was not another time, but another place that still existed. It was just that she had taken a wrong turn. One day, she would figure it out and she would go back to the house where she had lived, and it would not be lost to the violence of time, the roof caved in. It would be just as she had left it, and she would look up at the front of the house, and see the light on in the bedroom window. One thing I like about this book is that Lim focuses on the relationships between the characters, rather than the logistics of her dystopian setting. Making the distance of time be a factor in a relationship, she’s able to explore its impact. Even more intriguing is that, while one character is experiencing a 17 year separation, the other is experiencing a separation of almost no time at all. We are with Polly throughout the story, and we can’t help wondering what’s going on with Frank – is he feeling just as desperate as Polly? Has he moved on? Did he even survive? All that love. It can’t die. It has to go somewhere. A unique aspect of the book is that the future is actually our past. (Kerry at Pickle Me This calls it “historical speculative fiction?”) Woven into this dystopian love story, class difference is a theme that stands out as meaningful yet not too heavy-handed. Polly realizes as an 0-1, she gets better treatment, and is thankful for it and ashamed of it at the same time. When she is demoted to H-1, she feels trapped under the thumb of anyone in a more powerful position. “Look at me. I’m not like them!” She began to cry, out of shame that she’s said such a thing, and out of fear that she’d had to. 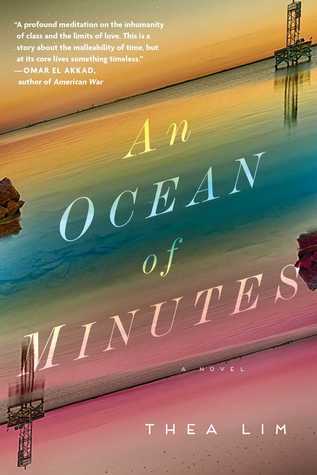 An Ocean of Minutes seems to have a little something for everyone… love, trust, speculative fiction, politics, ecology, social status, unpredictability, and even some cultural references to the 70s and 80s. This is Thea Lim’s debut – I look forward to whatever she writes next! This is my last review of the shortlisted Giller books for this year. Watch for the announcement of our Shadow Giller winner! This sounds intriguing Naomi. Dystopian fiction seems to be everywhere at the moment, but I like the twist of this actually being set in the past! This kind of fiction works best for me when it is character driven and this sounds strong in that respect. Me too, Cathy! I definitely recommend this one to anyone who likes character-driven dystopia! Sounds great. Already have it on order. I’m really excited to read this. It looks fascinating and wonderful — I love this kind of literary dystopia story, if that’s a genre? I hope it’s a genre – I like it too! It can be hard to determine which dystopian novels to read and which to leave – but this one has my recommendation! I’m glad you’re planning to read it! I love time travel stories, so I’ve had my eye on this one and was waiting for your comments. I’ve read some up & down reviews about it, but wanted to see which way you went. I’m feeling rather nostalgic at the moment, so something that takes me back to 70’s and 80’s might be just the thing! I hope you like it, Brona. After reading it and loving it, I was surprised to come across the discouraging review, but I say go for it! Especially if the time travel appeals. This does sound so well done – something in me is resisting putting it on my TBR, though. Maybe it feels like it’s potentially too distressing for my comfort level at the moment? I’m definitely keeping it in mind, though. If you become as invested in it as I did, you might find it distressing. But oh so good! It sounds like you really liked this one a lot. I want to get to it. Seems a fast read too. I have just come down from the news today that Esi Edugyan won her 2nd Giller. Wow. Even though I picked it to win — I’m stunned by the news ha. But I’m sure you will let us know which story was your favorite. I can’t wait to read a few of the nominees. Now that it’s all over, I can tell you that Songs for the Cold of Heart was my favourite of the five. Washington Black was my next pick, though, and it’s wonderful to see her win it for the second time! I think this is a good choice for readers not usually drawn to speculative fiction. It’s almost beside the point. Not only is it all about the relationships (and not so much the relationship between time and space either!) but those relationships are not simplified either. The connections she makes in the new time/space are rich and challenging. That was my favourite part of the book, and I know it’s not possible to discuss any of that in detail, because it’d be horribly spoilery, but I just loved the complexity she affords to the conflicts there. The line between harming and healing shifts and blurs, and just when you think you can locate responsibility/accountability, you have to reconsider and take someone else’s position into consideration. I’m glad you were pleasantly surprised by this one and I, too, am super curious about her next work! Yes! Her boss, the superintendent of her residence, the other women living with her – there were some great characters and conflicts! And even just her fear of everything. She had to learn a whole new set of “rules” for living in 1998. And she had to decide who to trust (and who not to!). That’s true. And I just realized that your last sentence actually stretches beyond those new 1998 people too, but I hadn’t thought of it that way. I guess she is also learning whether and how she can trust herself, right alongside all of that! Definitely an impressive debut. Maybe she’ll win with her next book!